This is the poster created from one of the children's paintings. This is Gavin's piece. If you are in the Deadwood, SD area tonight, stop by the Masonic Temple where the silent auction & sale of the children's artwork created a month ago at the First Steps after school day care. The paintings themselves will be for sale and ALSO note cards and mugs created from these paintings. Besides the paintings, other children produced the most beautiful photography I've seen in a long time! The event is this evening, 5pm to 7pm. Refreshments, wine, music, and art. Besides the children's art, this event coincides with the BLACK HILLS PAINT OUT! The plein air painters have been very busy all around the hills and the WET SALE will also be taking place at the Masonic Temple. Just 3 of the finished paintings for First Step Daycare fundraiser. Click here for full story. Or click the "Community Projects" tab above. Finished scanning in the 9 paintings the children from First Step Daycare did. Go to my Community Projects page and read about this fun project. The fundraiser is September 8, 2012 at the Masonic Temple. More info to come on that. The first project is for the First Steps Day Care Center in Deadwood. This center is having a fundraiser on September 8 and I am working with some of the 8 and 9 year olds in the center. We are doing paintings of Happy Trees, ala Kadinsky. A few years back, my friend, and former art teacher extraordinaire, Debbie Thompson, worked with her students with this same subject. We helped create stairwell murals of Happy Trees for KSB Hospital in Dixon. It was so much fun, I thought, why reinvent the wheel...do it again! I had a budget to get some paint, brushes, and canvases. Eight canvases to be exact. Initially I only wanted to work with 4 kids this age, but decided 8 would be the absolute limit. Kids have a limited attention span and my patience could only handle that many with loaded paint brushes at one time! Getting their ideas down on paper. The first day we started with some examples of abstract, fantasy-like trees, and got them to start sketching their vision of Happy Trees. At first they were stuck in the traditional looking trees, but after 30 minutes, they're drawings became very whimsical. The second visit entailed just a practice day with the use of mixing paints, applying paint, how to use their brushes, including keeping them clean. Oh, and NO black or brown paint was allowed on their palettes. Kids like to overuse those colors and everything eventually looks like mud. Pencil drawing by one of the kids. brushes and how to mix paints. A problem started happening with the attendance having different kids almost every day. Trying to have the same children throughout was proving to be difficult. Also, the new kids wanted to do the project, but they were already behind in lessons. Hoo boy. We made it work. In fact, one of the kids who started a lesson late, Gavin, proved to be a natural artist. I liked his work so much, that his drawing replaced one of the original children's drawings (also, this child's schedule didn't allow her to be there when I was...thus, she wasn't able to finish the project). Enlarged kids' drawings with their crayon sketches next to them. Base coat of red over all of them. Bring on the kids! After picking the drawings I thought would be the best paintings for the sale, I enlarged them on professional canvases. I noticed that there were 9 drawings that were great. So, I went to my studio and found a canvas that wasn't too big for a child to paint in one sitting, but it was a tad smaller. Now we have 9 paintings to work with! 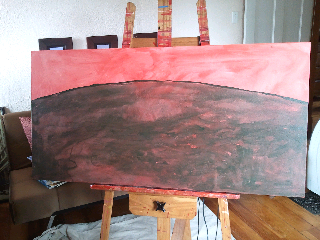 After drawing the paintings, I redrew them with a black sharpie and then painted the whole canvas red. Yes, red. I paint all of my paintings with a warm color before painting. It makes it less daunting to face a white canvas. The third visit, I got in the room, set up the desks, put out the plastic tarps, filled all the palettes, put out water, brushes, paper towels.... You know how many of the original 8 kids showed up? Three. So... we got three out of 8 finished. The next time I arrived, I managed to get a few more original kids, but the ones whose drawings I didn't choose, were allowed to paint the canvases of the kids who didn't show for the final day. So, those paintings will have both names on them. Here are the proud artists with their paintings. Some of them are the original artist & painter, and some are the painter only. For all of the paintings, I took them home and cleaned them up a bit. Covered up the spills, smoothed out the smears, etc. Also, since I'm a big girl...I get to use BLACK and some fun metallic paints. I use the black to lightly outline their tree illustration to make their colors pop. And a bit of gold and copper is fun. Just added some whimsy. And you know what? When the kids saw their paintings later, they didn't even notice that I nudged them a bit. They just smiled and preened in front of everyone. I love that part. Nyla Griffith, one of the main people to make sure this day care facility became a reality for the city of Deadwood, will be making poster of one of these paintings to advertise the fundraiser. I'll publish that later! A quick note. I've been redesigning my blog to reflect new things going on with my art and life in general. Look up just above the top post and you'll see that I've added some tabs. One is called "Community Projects." I have a couple of things going on. Finished piece. I really like it, but it's kind of hard to tell because the finished product is a bit blurry. My good camera has uttered its last click and all I have is my phone. Just had a thought. Jack has a good camera and he does a lot of photography. Duh. I'll just have to put him to work. However, he just finished mowing the lawn with a push lawn mower. He needs a bit of a rest! The hill is in Custer State Park in Custer, SD. Great place to see prairie dogs, antelope, and of course lots of free roaming buffalo. We went when there were lots of baby buffalo. This hill just stood apart from all the pine trees and aspens. Check out the pictures below of my process doing this painting. In case some of you are new to my blog, I start every painting with a colored base...normally a cad red or orange or a variation of some warm tone. It gives the painting a head start and isn't as intimidating as starting with a blank, white canvas. Just getting in the groove. A cold, rainy day makes it easier to buckle down and paint. This is from a photo taken last weekend when my daughters visited from Chicago. We were driving through Custer State Park and my oldest bolted from the car to climb the hill that had only one tree. Still deciding whether to finish in oils or acrylics. Frank is our black pug. He's seven now and quite the clown. I started this painting of him before Christmas, but got side tracked with holiday stuff. It was going to be Jack's Christmas gift, then his birthday gift, and now it's his Easter gift! This is a rather posterized style that I haven't done before. Frank seemed to be the perfect subject for this type of painting. In fact, he slept near my feet the whole time I was working on this today. I haven't been in my studio a lot because it has become the catch-all for all kinds of junk. So we purchased a couple sets of 3-shelf bookcases really cheap and Jack finished putting them together yesterday. Now I can load them up with stuff sitting in boxes all around the place. Once I was done with that, I actually wanted to spend a sunny afternoon painting in the place -- and I did! Planning on spending more time doing just that. Before I give you a link to an article for documenting your artwork digitally, I thought I would update y'all about the results of the Winter Art Show (from my previous post). I was honored to receive 2nd place in the Professional category. This was my first award since moving to SD. I am to do even better next time! View 1: Some of the Professional Category...My "Autumn Path" is there. Can you find it? View 3: Some of the 3D work from both categories. Well Saturday certainly was a busy one. It started off with a women's networking lunch and program at the Seven Grill Restaurant in Spearfish, SD. Soon after, I went to the Spearfish Arts Center, where I have pieces on display, to help get the 2012 Winter Art Show hung. Let's see, I got there just before 2 p.m. thinking a few hours would be the most it would take to get this puppy up. Ahhhh....that was a bit optimistic. We got the last nail pounded in around 8:15 p.m.
Thursday, February 23rd AWARDS ceremony at 6:00 PM. Up next, it is our busiest week with our biggest group coming in at The Lodge of Deadwood. We'll be working some very long days next weekend. After that, I will be back at the old easel!